By this point, you probably know that you should be wearing sunscreen not just when you’re in the sun, but any time you leave the house. However, just like flossing, many people haven’t quite solidified this healthcare habit. Part of the problem may stem from not understanding the importance of protecting your skin from the sun. It can be hard to prioritize something when you don’t completely get why you’re doing it. There’s a lot to learn about how the sun can affect your skin, but a great place to start is by knowing about UV light, and the difference between UVA versus UVB rays. UV light, short for ultraviolet light, is a type of electromagnetic radiation that emanates from the sun and reaches Earth. UV light is different from visible light rays, which are longer and can be seen by the human eye. UVA and UVB rays are two types of UV light. Both fall into the “short wavelength” category, meaning they are invisible to the naked eye. Though they can’t be seen, that doesn’t stop them from wreaking havoc on our skin. You may conjure up an image of glow in the dark or black lights when you hear the term UV light, and that isn’t wrong! A blacklight emits UV light, which causes certain objects and colors to glow. Tanning beds use fluorescent bulbs that emit mostly UVA light. UVA rays make up nearly 95% of the UV radiation that reaches the earth’s surface. They are the most powerful category of UV light, are consistently present during all hours of daylight in every season, and can seep through many substances, most notably cloud coverage and glass. Yep, you read that right — UVA rays reach right through those clouds and the car window that you might have thought were protecting your skin from the sun. UVA rays penetrate skin more deeply than UVB rays, reaching through the epidermis (top layer of our skin) and into the dermis (the middle layer of our skin). They’re what help us tan, but they’re also what causes signs of aging in the skin — they’re the culprit behind wrinkles and fine lines. 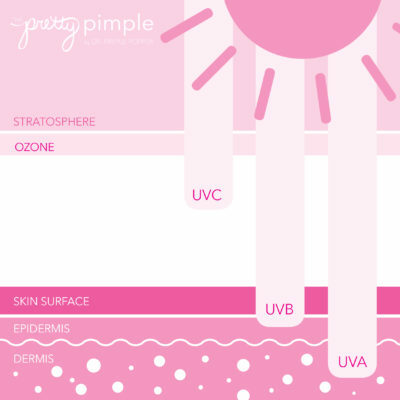 When UVA light reaches our epidermis, it damages the basal and squamous cells, called keratinocytes, in the skin’s basal layer. 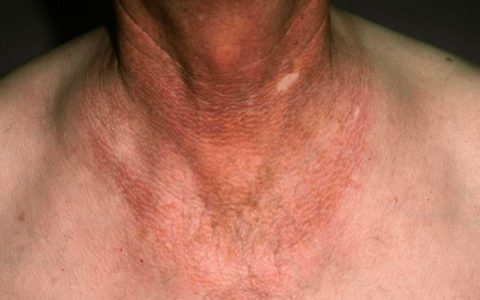 This is where most skin cancers occur, and damage from UVA rays is known to initiate the development of those cancers. UVB rays, on the other hand, primarily cause damage in the epidermis, or top layer of the skin. They are responsible for causing that painful redness we call sunburn and play a significant role in causing damage on the skin’s surface. Over time, they also cause cancer. UVB rays can reach the earth’s surface (especially high altitudes) throughout the year, but if you are living in the U.S., they are most likely to affect your skin between the hours of 10 AM and 4 PM during the spring, summer and early fall. So Which UV Rays Cause Cancer? In a match up of UVA versus UVB rays, which are the most dangerous? The short answer is that they both are, but in different ways. While UVB rays can cause visible damage in the short term, leaving you with an uncomfortable burn, UVA rays cause damage in the long run by expediting the signs of aging. In other words, too much exposure to either UVA or UVB rays can cause skin cancer. Luckily, the answer is pretty simple: By choosing a sunscreen that’s broad spectrum or full spectrum, like the SLMD Skincare Daily Moisturizer with SPF 15. Broad and full spectrum sunscreens protect the skin from both UVA and UVB rays. Always make sure that your sunscreen has a minimum SPF of 15, and apply it regularly and meticulously! If your using sun screen, will that also block out getting vitamin D or not? Second would be is what uh produces vitamin D? Why does my dermatologist insist on my sunscreen having zinc in it?